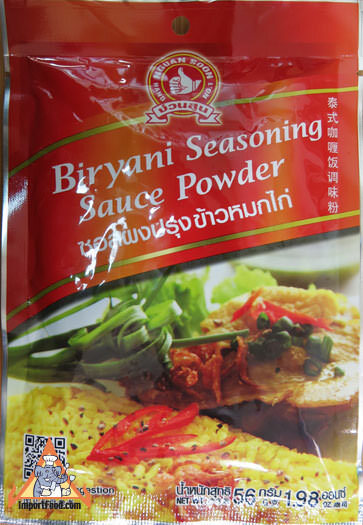 This delicious, aromatic seasoning is used for making yellow jasmine rice, and it's so incredibly good that we recommend it for not only home use but also for the finest restaurants or catering services. You can simply not match the quality of these imported spices mixed perfectly for the best taste. Your friends and neighbors will never know how you can make such perfect, exotic, full-flavor rice, and the price is very attractive. You get a nice 1.98 oz pack which is enough for about 6 large bowls of rice (each bowl enough to serve several people). There are instructions on the package. Add 4 tablespoons with a bit of vegetable oil and chicken stock to 2 cups rinsed jasmine rice, put in a rice cooker , turn it on and wait 20 minutes until it's cooked. Pictures below show the recommended recipe, use less biriyani seasoning for a lighter color. Suggestion: Serve your biriyani rice topped with cooked chicken. Serve with a dish of ajad on the side (see below), sprinkle the rice with fried shallot. In a small saucepan, mix vinegar, salt and sugar over medium heat. Stir until dissolves, then remove from heat and set to cool. Just before serving, add the cucumber, shallot and sliced chiles to this. Serve in a bowl with your biryani rice. Ingredients: salt, turmeric, sugar, chile, corriander seed, cumin, bay leaves, cinnamon. All natural. No preservatives. Product of Thailand.